Yeah I've had a play around with my sister's Huawei P9 which is very impressive at macro and low light stuff. Bit high-contrast on the stock camera settings, but definitely more what I'm after than the Z5 (great camera, but wide-angle lens is tailored to landscape shots). 'What happened at the lab was regrettable'. On the face of it that didn't sound like that stern of a rebuke, but only an Inquisitor could say it in such a way that you knew you were up the proverbial creek. Now he had a new task. Travel into the Fenrisian Reaches and recover evidence of these wolf-mutants in the wild. The Fenrisian Reaches! Emperor's teeth. Not a place he'd hoped to visit. Less an official sector, more a band of space radiating from the home of the Wolves. An unintentional diaspora of fenrisian stock, scattered in the wake of the Wolves' crusades. A savage place inhabited by savage people. Still, he was a little excited to be out in the field again. Cataloguing strains of human mutation was his primary mission after all. Perhaps there would even be the opportunity to sell some novel ones to his contacts in the lunite gene-crafters or something. Yes, you know, this expedition might not be that bad at all. IV and VII were just simple replicae-drones. Capable, obedient and most importantly easily replaceable. Ideal for a trip to the Fenrisian Reaches. Luggage, on the other hand, he was genuinely proud of. Simple thing really, but it was entirely of his own design. A chore for each drone... and luggage? He looks eager to please. Nice one, Ynnead!... Be well! I didn't realise they had priests, or shamans, or whatever they are. Just blessed magic. Yes please to the cropping, mate... and a priest? Niiiiice! Kicked another goal, Ynnead... Be well! Wow they look great Ynnead. 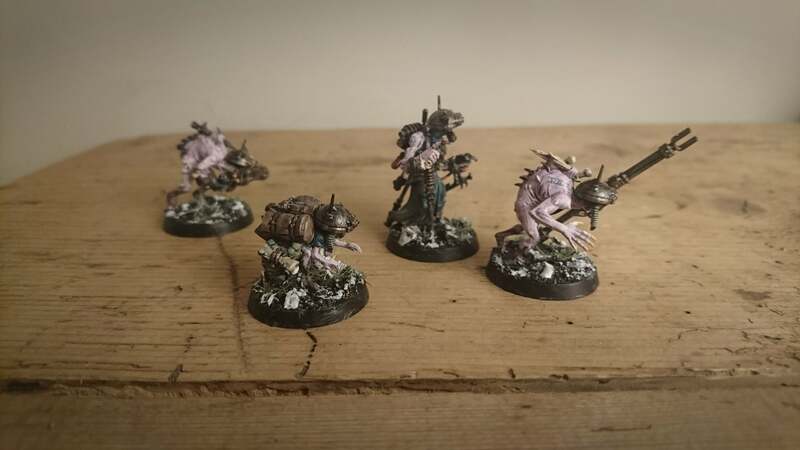 Just fantastic little gribblies. 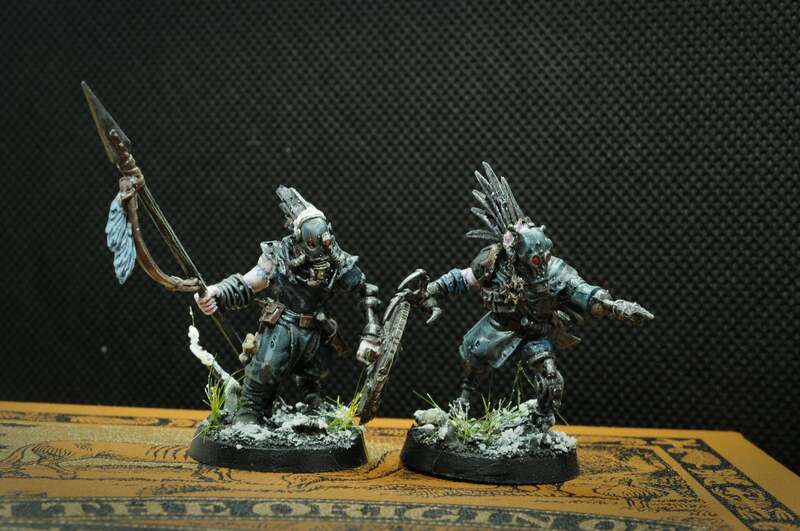 The modelling is absolutley top notch and the paint jobs are freaking awesome! Your painting skills were always strong, but I feel like you've really leveled up man. 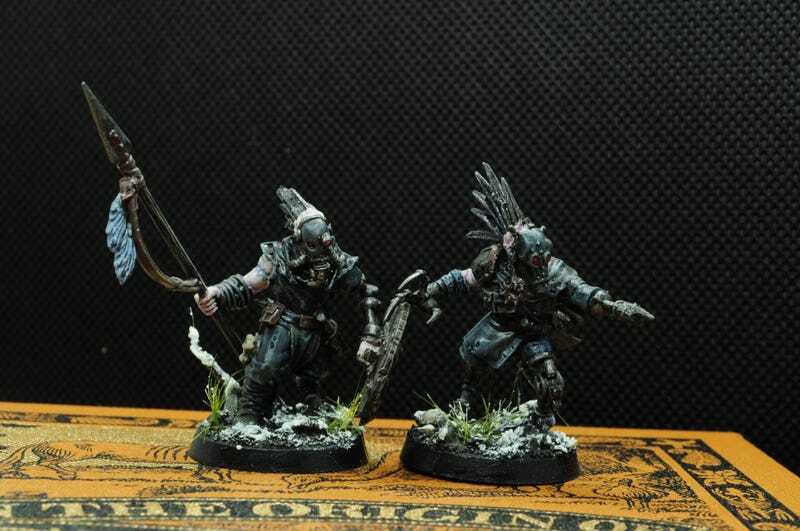 Just awesome looking models. They look almost alive! Always creative, always awesome. Keep on rocking man this stuff just keeps getting better. 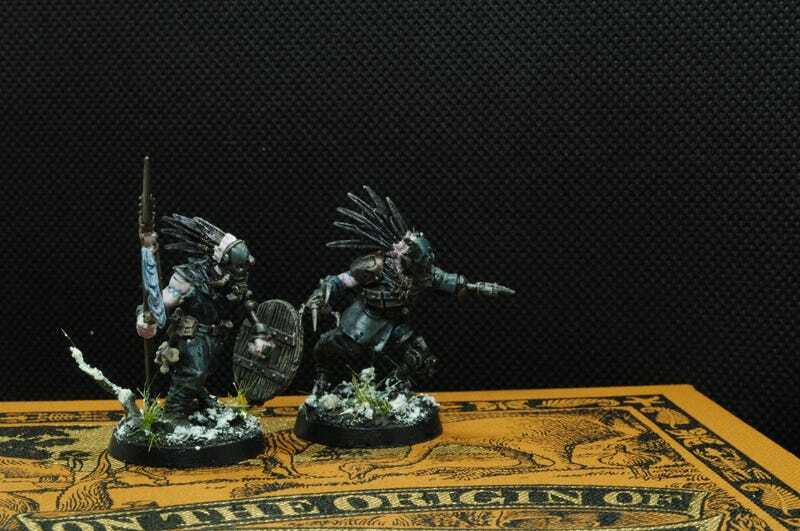 That shaman is an excellent model Ynnead! So believable it almost looks alive actually. On the darkened moons above the nine realms lurk a pale and pallid people. Void-folk the kearls call 'dokkalfar'. There are few among those stranded folk that retain the ability to travel between worlds. The Crows have ships, with which they flit between battlefields picking over the spoils. The dokkalfar have ships, with which they raid and plunder the worlds below. Alfar voidsuits, although roughly made, are prized possessions throughout Útgarðar. Similarly, alfar weaponry is deemed to be of finer quality. If life is so hard on their airless moon, you ask, why don't they invade the land below? Simple. Gravity. Their bacchanal rites before raids involve ritual partaking of steroidal substances, for despite their continual consumption of low-grade steroids a kearl still has an edge. In the long term, our world is as hostile to them as theirs is to us. So that's the first of the Dokkalfar the idea and look of these guys has been rattling around in my head ever since I saw this awesome thread over on the INQ28 boards. The phrase 'The Handmade voidsuits of the nomadic tribes of the northern Segmentum Ultima reflect a familial lineage of mariners, explorers and merchants.' just opened my mind to the idea of techno-tribal cultures living in void environments. So yeah hope you like them! Oh, and speaking of painting, if I started with a black undercoat rather than white these would be the easiest and quickest things to paint in the world. Undercoat black, rough drybrush of Administratum Grey on cloth, rough drybrush of Leadbelcher on metal followed by a smaller drybrush of Chainmail (remember that?! ), pick out red lenses and wax (Wazdakka with Wild Rider highlights for optics), Ushabti Bone ceramics and paper, couple of spots of Warplock Bronze on pipes and stuff, wash the lot with gloss Nuln Oil. Job done! 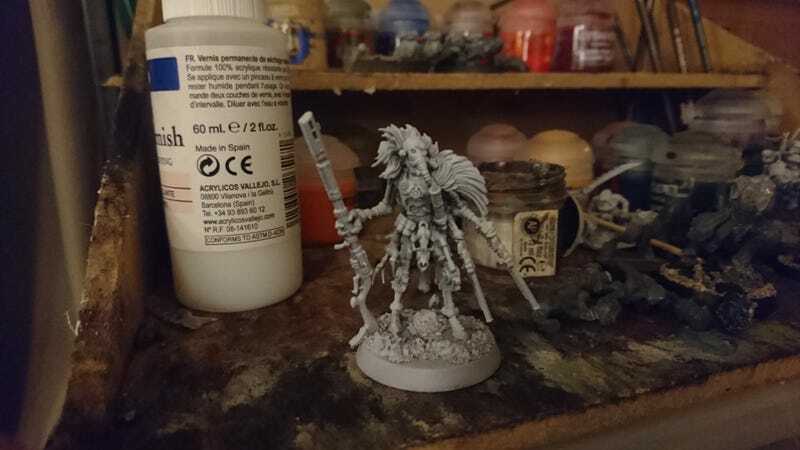 Only question is how to paint him. Tried with the other two but was never happy with the result. Very nice Ynnead. I really like these guys.... man you should really start some kind of RPG campaign with all this stuff. Gather up a few guys, pick a system (maybe play a heavily "counts-as" version of Kill Team) and have people pick a faction or something and you could Dungeon Master some adventures. Just brilliant stuff man. Love the Barsoomian dude too. What bits did you use to make him? Incredible he's unrecognizable! Anyway keep it up man and please do us and your local area a favor.... play some games with these guys! People will be blown away! Love this stuff, mate. 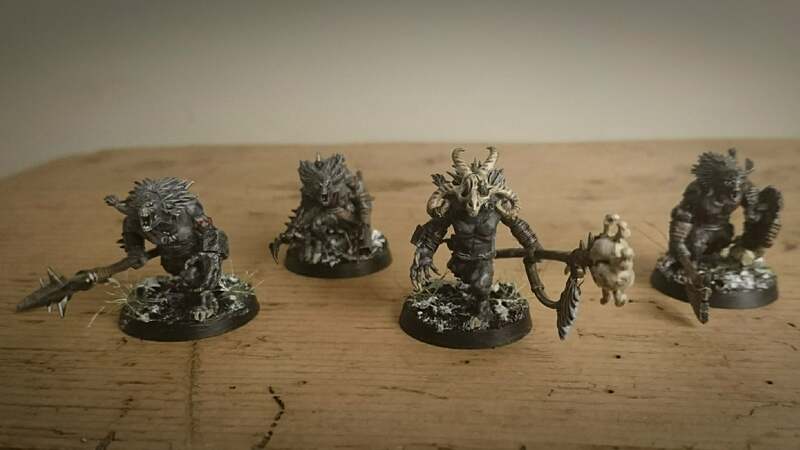 The flash gitz of the nine realms. Something HAS to come of these worlds you've created, mate. They're so rich in character. Palease give us, (Your fans), a batrep... Be well! Just got back from a big road trip round Wales which was brilliant fun, but not much hobby movement I'm afraid. Oh, I do also have this slightly darker version. Which do people prefer? Thos photos are so much better Ynnead. It's nice to be able to see all the detail and quality of your brush work...and it is really good quality. You must be really happy with the results...and the fact you finally get to share good quality picture which display the true quality! As for which is better, I prefer the first, lighter picture. You just get to see so much more detail. The lighter picture is the way to go if you want to show off your work. The darker one would be good if you were doing a sstory setting. I love all of these Ynnead. Especially the bases of all things! To pry their spoils from dead men's grips. I know what you mean about camera shots. I've had a lot of bad shots on some of my favorites and the details just are off as well as color. I have to say I really like what I see here, great stuff! 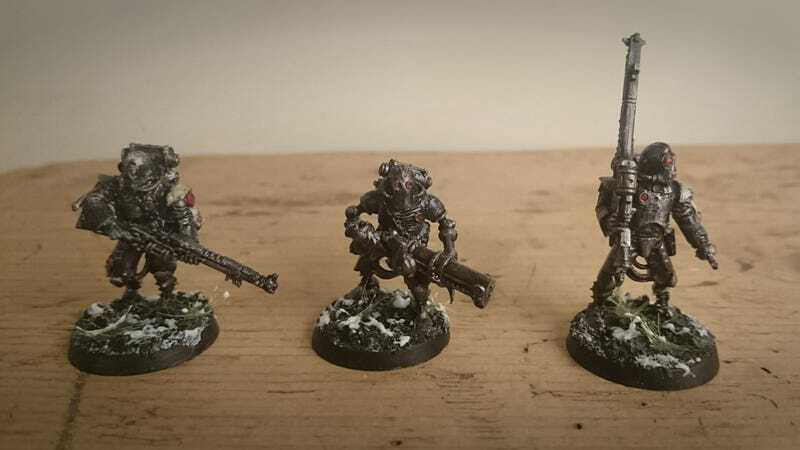 I'm waiting for new kill team rules before I set up my team or teams. 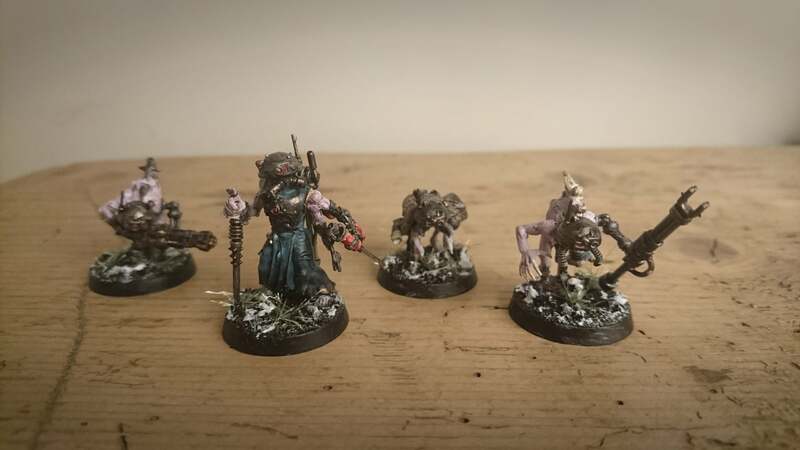 So what is the backstory for these models you're creating / kitbashing? I want to say Traitor Guard or Dark Mechanicum? They have that real eerie vibe, but in a great way ! 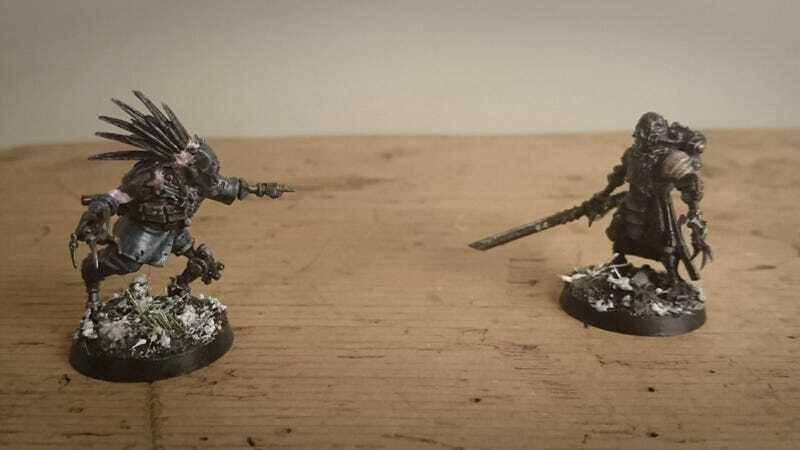 They really give me that grim dark vibe! 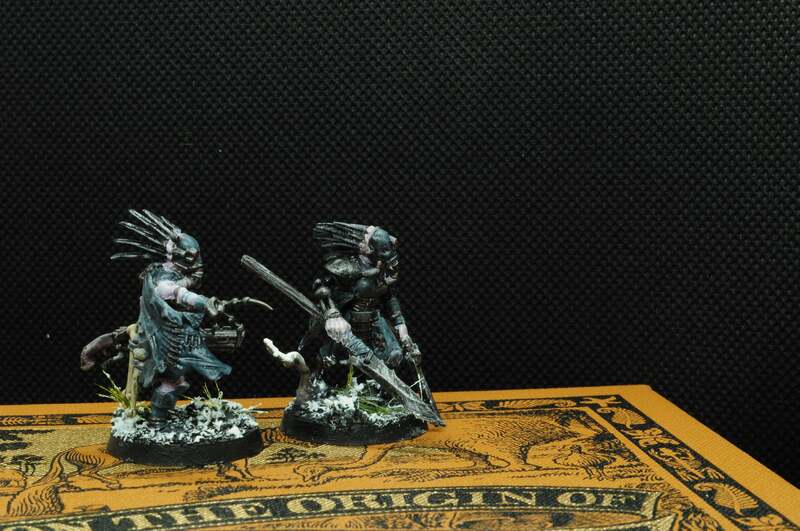 The guy at the bottom of the images is my absolute favorite, with the beastmen-like guys coming a close-second. 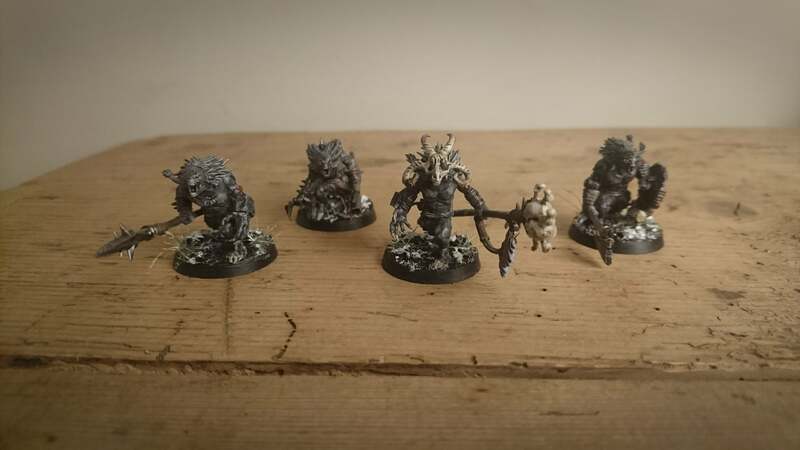 Loving the way you created these dudes! Look forward to seeing more . @MyelTal Well...the backstory to the lot of them is pretty convoluted. The quilled Crows are abhumans that loiter around the periphery of the Space Wolves, scavenging from battlefields. One of the previous battlefields involved a chaos incursion that used the horned Elk-men as footsoldiers, and when it was defeated these were stranded planetside as their leaders fled, and developed their own local cultures. 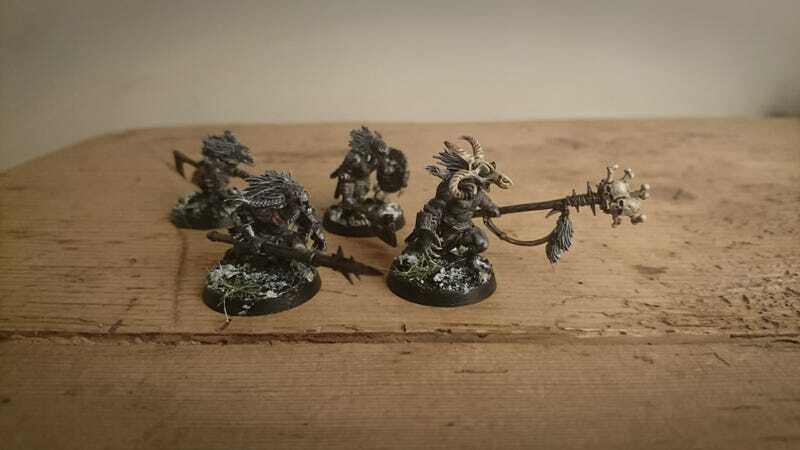 Similarly, there's populations of Space Wolf kearls stranded too which I haven't got around to yet. The Crows sometimes flit about these abandoned worlds scavenging from battlefields, and planetside folk sometimes trade for transportation to wherever the Crows are headed to next. 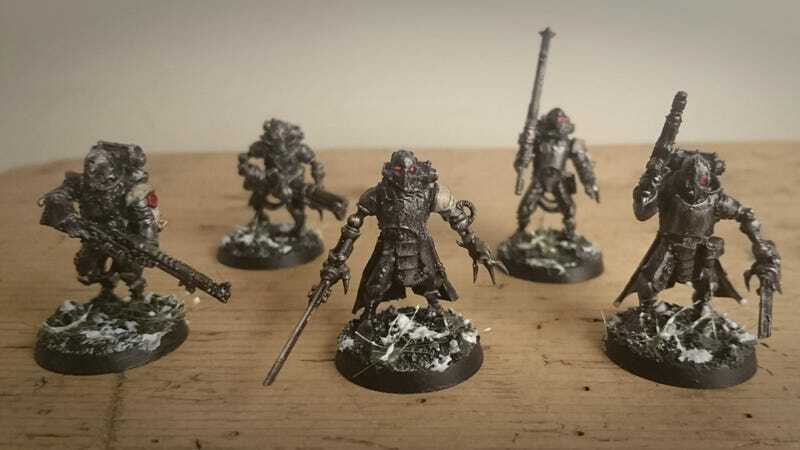 The Dokkalfar are parasitic raiders living on the airless moons above these worlds. The original population is descended from a crashed tithe-ship, which has instilled in their descendants a skewed notion of their divine right to raid the planets below for materials, slaves and oxygen. 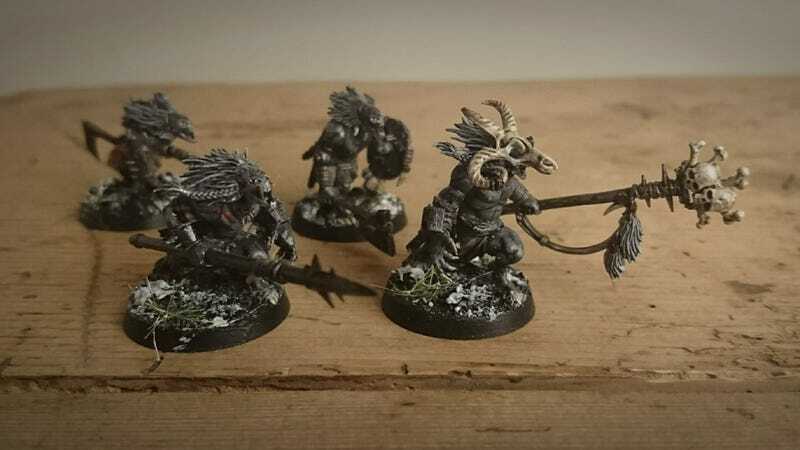 The Freki wolf-men are my idea for what happens when the canis helix infects regular folk rather than Astartes, which give rise to werewolf-like populations of mutants in the wake of the 13th Company (which the Inquisition are very interested in!). 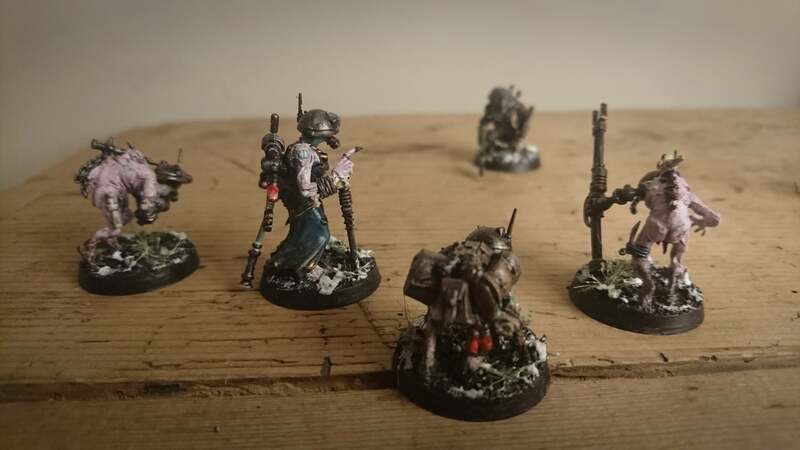 A pending Inquisitor has employed a Biologis Adept to investigate this, which is the little Biologis warband. He's pretty out of his depth though! I like your intricate backstory ! Helps give some context to the creations we see before us, though they certainly possess that cool-factor without it!